Please note our new Training Fees, effective from 1st January 2019. This is the first increase since 2011 and is neccessary to accomodate the increase in dojo hiring fees that have increased with CPI over the past 8 years. Held only every few years, Mountain Training is a very special event for students to spend a few days focusing on training, while living with other students. Training is held outdoors, including at sunrise and sunset. To breathe in bitingly crisp, cold mountain air from one of the highest points in our state, and use the energy of your surroundings to focus your mind is indescribable. Download the full notice here. In line with new guidelines from the Victorian State Government, Aikido Victoria has updated their Child Safety Code of Conduct and Statement of Commitment. These documents are available on our website (link) and have been distributed to all instructors and members. TRAINING FOR TWO – in the Fourth age. Janene Godden has written a fantastic piece on her personal Aikido journey, receipt of the Beverley Webster Award and what Summer School means to her. It's a terrific insight into her perspective and a must read for all of us. Thank you Janene. 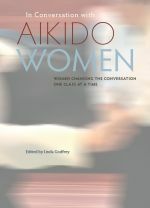 Following on from the successful Women in Aikido forum held during our 50th Anniversary celebrations, this important publication documents the insights into Aikido training from the perspective of many senior female students from Australia and around the world. Edited by our own Linda Godfrey sensei, this wonderful initiative is recommended to all students and instructors. More details including the Forward from Tony Smibert Shihan and table of contents can be viewed here . You can purchase a copy of the book online from the Aiki Kai Australia store here or email Aikido Victoria directly to make other arrangements. Parents please note this class is moving to Monday nights from March 28 2016. Special recognition for personal achievement and enormous contribution to Aikido was given to Beverley Webster at the TTC Weekend on the weekend. Additionally, a special annual award has been created in her honour. Congratulations Beverley!